Chocolate desserts, cakes and cookies, cupcakes and…. Christmas spirit? You betcha! The arrival of the holiday season brings about a wealthy amount of Christmas desserts and other holiday recipes to be suggested for your holiday menu. Red velvet cake and cheesecake have both long been favorites among many millions of people who appreciate cookies and cakes. This holiday season you can have the best of both worlds with this delicious red velvet cheesecake complete with a burst of Christmas spirit. The unique snowflake pattern on the topping of this cake and passionate colors combined with the delicately sweet taste is certain to have you coming back for seconds. With that thought, you better make two! Step 1: In a medium sauce pan over a low heat setting, melt your 1/2 cup of butter and chopped chocolate. Once your mixture has completely melted, remove from heat and transfer to a separate bowl so that it can cool. Reserve for later use. Step 2:In a large food processor, combine your chocolate wafer cookies, semisweet chocolate pieces, chopped almonds and light brown sugar. Cover the food processor tightly and process until all of the added ingredients are finely ground and mixed thoroughly. Once this is done, add your other 1/2 cup of butter and process the ingredients again. When this is done, transfer the crumb mixture to a 10×3-inch pan that has a removable bottom. Press the mixture firmly to the bottom and along the sides of the pan, leaving at least a half-inch of space at the top of your pan. Set this aside and reserve for later use. Step 3: For the filling of your red velvet cheesecake, you will need to beat together your cream cheese, sour cream, buttermilk, sugar, red food coloring and the cooled chocolate mixture that you prepared earlier. The best way to achieve the desired result is to use an electric mixer on medium or high speed. Once thoroughly combined, add your 4 large eggs and 2 egg yolks simultaneously and continue to beat with an electric mixer on low speed until all of the ingredients are thoroughly mixed. Step 4: Pour all of your combined ingredients into the cake pan that you set aside earlier. Set the cake on a shallow baking pan and place in the oven for 1 hour at 350 degrees. When you can gently shake the cake and the outside edges appear to be set for at least 2 inches, your cake is ready to be removed from the oven. Step 5:Remove your springform pan from the shallow baking pan and allow your cake to cool on a wire rack for approximately 15 minutes. When the appropriate amount of time has passed, gently loosen the cheesecake from the sides of the pan using a spatula. Cool for an additional thirty minutes before removing the sides of the pan completely and cooling for a remaining 1 hour. When your cake has cooled sufficiently, refrigerate it for at least 4 hours before serving. 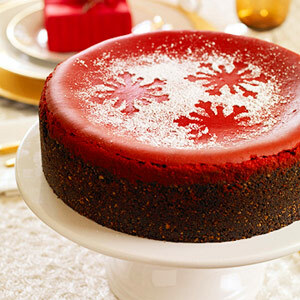 Step 6:To garnish your red velvet cheesecake with the snowflake, place a paper doily in the shape of a snowflake on the top of your cake and sift powdered sugar over your cake. Remove the paper and voila! You have a beautiful holiday cake ready to complete the finishing touches on your holiday meal. One of the greatest things about Christmas is that it’s the perfect time to build a gingerbread house. 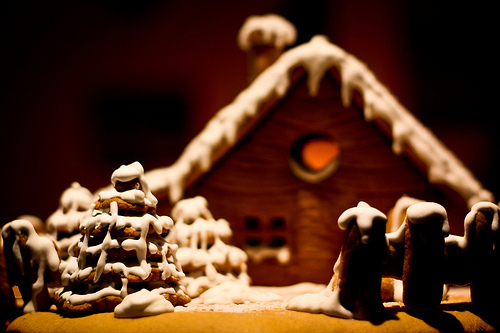 And what makes a gingerbread house wonderful? The creativity, of course. The possibilities when making a homemade gingerbread house are absolutely endless, limited only by your creativity and ideas. Some gingerbread houses are small, some are large. Some are simple while others are elaborate and intricately detailed. Because there are so many possibilities, sometimes just knowing where to start can seem overwhelming. 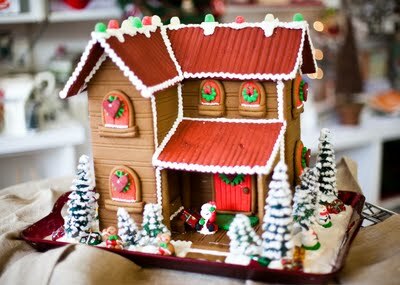 For that reason, I’ve gathered up some of the best gingerbread houses pictures to give you a head start on some great ideas for your gingerbread house decorations. 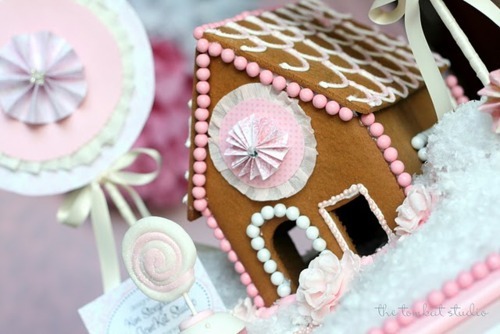 I absolutely adore this gingerbread house cabin. With the red roof and the beautiful detail, just looking at this photo has me wishing for a winter getaway in a beautiful log cabin. If you’re looking for gingerbread house ideas that have a little more Christmas spirit in them, this peppermint gingerbread house packs a lot of inspiration. 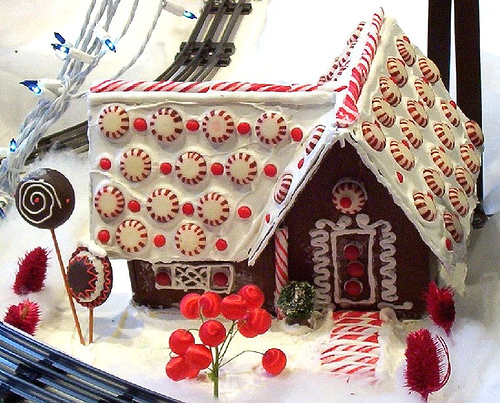 With a candy cane walkway and peppermint roof tiles, this one sure is one minty holiday treat. Having a Christmas wedding? This particular gingerbread house design is certainly fit for a princess and if you or someone that you know is going to be having a Christmas wedding, consider creating or custom ordering a gingerbread house centerpiece to accent the big day. The great thing about gingerbread houses is that there are no limitations, leaving you free to create a unique, colorful gingerbread house like the one pictured here. 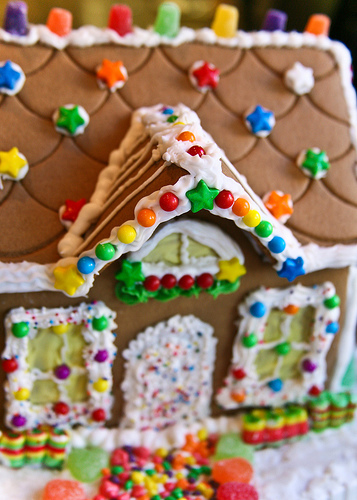 With so many colors and interesting shapes, kids and adults can all enjoy creating a great gingerbread house.